Lu'ah Al-Skaven is a Redguard conjurer in Ansilvund whose husband, Saeel, died for the Empire in the retaking of the Imperial City from the Aldmeri Dominion. Her journal documents her research into using conjuring magic to infuse her husband's soul into another body. Unsuccessful, instead she starts raising an undead army of draugr. Lu'ah Al-Skaven wears a pair of boots and a set of leveled black mage robes. She will either carry a Staff of the Familiar or a Staff of Zombies to help her in combat. However, as an experienced mage she also knows a variety of spells. On her left hand she will use Grand Healing, Greater Ward, Ironflesh, and Close Wounds. On her right she will use Revenant, Dread Zombie, and Turn Greater Undead. On either hand she may use Ice Storm and Ice Spike. You will first hear Lu'ah Al-Skaven long before you actually see her. She will communicate to you as a disembodied voice, threatening you and commanding you to leave. You will first hear the voice as you begin to progress into Ansilvund, with her identifying herself and commanding you to leave: "I am Lu'ah Al-Skaven. Who are you to disrupt my work? Begone, or I will add you to my army of the dead!" While she says this she will raise more draugr to try to stop you. 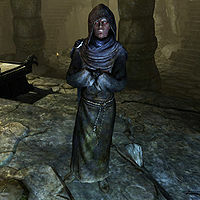 If you ignore her command and proceed through you will once again hear the voice, this time simply raising more draugr to challenge you: "Rise from your graves to defeat this worm" If you proceed into the Ansilvund Burial Chambers she will proceed to continue harassing you with draugr: "I shall have vengeance for the death of my husband. Rise!" Continuing on will have her raise more undead for you to fight after saying: "I could not raise him, but I will raise an army to avenge his defilement!" Once you finally reach her chamber she will monologue about her motives for a bit before finally attacking you: "They burned his body before I could raise him... it should have been returned to me... You will not stop me from killing those who wage this pointless war!" Once you put her down, the ghosts of Fjori and Holgeir will appear to thank you for your deed before rewarding you with Ghostblade.